Rodger Kamenetz, acclaimed author of The Jew in the Lotus, has long been fascinated by the mystical tales of the Hasidic master Rabbi Nachman of Bratslav. And for many years he has taught a course in Prague on Franz Kafka. The more he thought about their lives and writings, the more aware he became of unexpected connections between them. Kafka was a secular artist fascinated by Jewish mysticism, and Rabbi Nachman was a religious mystic who used storytelling to reach out to secular Jews. Both men died close to age forty of tuberculosis. Both invented new forms of storytelling that explore the search for meaning in an illogical, unjust world. Both gained prominence with the posthumous publication of their writing. And both left strict instructions at the end of their lives that their unpublished books be burnt. Kamenetz takes his ideas on the road, traveling to Kafka’s birthplace in Prague and participating in the pilgrimage to Uman, the burial site of Rabbi Nachman visited by thousands of Jews every Jewish new year. 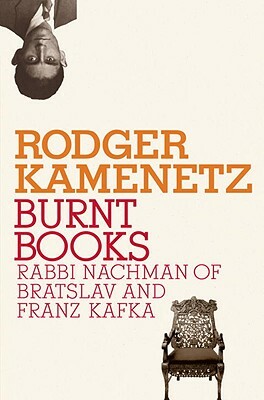 He discusses the hallucinatory intensity of their visions and offers a rich analysis of Nachman’s and Kafka’s major works, revealing uncanny similarities in the inner lives of these two troubled and beloved figures, whose creative and religious struggles have much to teach us about the significant role played by the imagination in the Jewish spiritual experience. Rodger Kamenetz is the author of The Jew in the Lotus and The History of Last Night’s Dream, and of seven other books of poetry and prose. A winner of the National Jewish Book Award, he recently retired as LSU Distinguished Professor at Louisiana State University and was founding director of its Jewish Studies Program. He lives in New Orleans with his wife, the novelist Moira Crone, and works as a dream therapist. "A book for anyone who feels the narrowness of a wholly secular life or who wonders about the fate of esoteric spiritual traditions in a world that seems bent on destroying or vulgarzing them. It is a narrative about an extraordinary moment in history, of course, but it is also the chronicle of Rodger Kamenetz's discovery of what he says is a more nourishing Judaism." "Splendidly written from beginning to end, this is a book that might and should be read for the simple pleasure of watching an honest intellect confront its own image . . . A book that should be read and discussed by those interested in the marvelous complexity and resilience of the human soul."